The 34th president of the United States, Dwight D. Eisenhower, had served as a five-star general during World War II and as supreme commander of European allied forces. In 1952, Eisenhower won the presidential election, and during his presidency he held many accomplishments, including effectively ending the Korean War, staging a coup d’état of the Iranian leader in 1953, and presenting the “domino theory” to explain the threat of communism to Americans. As a young boy, Eisenhower was interested in hunting, fishing, and other outdoor activities. In his schooling, Eisenhower performed well in arithmetic and spelling. But it was a love of reading and history that drew Eisenhower to fulfill a growing interest in military and war history. Eisenhower attended West Point in 1911, and against his mother’s wishes began to plan a military career. In 1916 he proposed to and married Mamie Geneva Doud, whom he met while stationed in Texas. They had two sons, one of whom died at age 3. After the war, Eisenhower retired from the military and became president of Columbia University. Parakeet named Gabby, buried in 1957 at the southwest corner of the executive mansion. In 1952, after being appointed supreme commander over NATO forces, Eisenhower ran for the presidency. With his military background, he was able to end both the cold war and the Korean War. It was during this time that the hydrogen bomb developed in Russia and the United States, causing an immediate need for discussions between the world leaders. While nothing was agreed upon during the meeting, tensions did relax. During Eisenhower’s second term, he focused on domestic policies including desegregation of schools and armed forces. He also refocused attention back onto maintaining global relations. 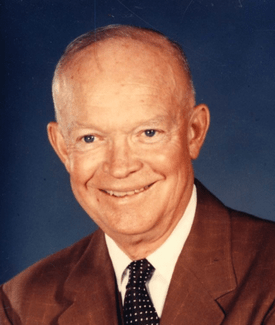 Eisenhower made lasting contributions during his presidency, including creating the Interstate Highway System, launching the National Aeronautics and Space Administration (NASA), focusing on deep space discovery, and expanding the social security program. Both of his terms were marked by times of peace as well as scientific explorations. When Eisenhower was growing up, all the boys in his family were nicknamed Ike for short. 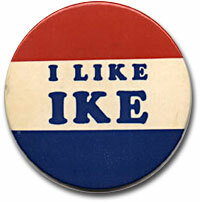 During the 1952 presidential elections, Eisenhower’s slogan became the catchy and memorable “I Like Ike.” Constituents were heard chanting this slogan throughout the elections, and it quickly caught on like wildfire. Eisenhower opposed Joseph McCarthy and the era that later came to be known as McCarthyism. He even wrote a private letter in which he denounced McCarthy and his “witch hunt” trials. However, he chose not to speak against him publicly because he felt that to do so could damage the presidential prestige that his position called for. Of course, there were many people who disagreed with him and wished the president had spoken against McCarthy before the trials got out of hand, which they quickly did.